If you haven’t had much experience with a motorhome before, it can be hard to know what to look for. Before you get too far with your research, it's useful to find our how motorhomes work. Most campervans and motorhomes have power supplied to the living compartment by a 12V house battery and 240V mains power when you're connected at a campsite. The 12V house battery is separate from the starter (engine) battery so you can still start the engine even if the 12V house battery is running low on power. The 12V house battery powers the fridge and the lights in the living compartment as well as the water pump and DVD player so these will work when you're not plugged in. The 12V house battery is recharged while driving and when the motorhome is plugged in to 240V mains power. 240V mains power is required to operate all appliances installed in the motorhome other than the fridge such as the microwave. You’ll also need to be plugged to mains power to use the power sockets to operate any electrical equipment like an electric jug, toaster, portable heater and any devices you may have brought with you (laptop computer, digital camera, or mobile phone charger). While driving does recharge the 12V house battery, hooking up to 240V mains power will ensure the battery is fully recharged. You can connect to 240V mains power at a campsite with the power lead provided. In New Zealand and Australia, mains power is supplied at 240V with a frequency of 50Hz. Appliances requiring more than 600W of power can only be used when you're connected to 240V power at a campsite. Watch the following video on how the electrical system in a Wilderness motorhome works. Check the electrical equipment you plan to bring runs on 240V. If no, you will need a voltage converter. Check your hairdryer, straightener or curling tongs operate with 600W or less. Or just leave them at home and bring a hat instead! The house battery in most rental vehicles won’t last more than a day without having to be recharged by the engine or by 240V mains power. If the 12V house battery power gets too low, the lights in the living compartment and the DVD player won’t work; plus you’ll be drinking warm beer. All Wilderness motorhomes have additional battery capacity so unless you're using the DVD player for several hours while freedom camping, the house battery will last two to three days before needing to be recharged. The longer the motorhome’s house battery lasts without having to start the vehicle or connect to mains power, the more freedom camping you can do. Our motorhomes also come with a power inverter. The inverter converts power from the 12V house battery to the 240V needed to operate many appliances and accessories such as a laptop, MP3 player, or mobile phone charger when you're connected to mains power so they’re a must for freedom camping. All our motorhomes come with sufficient fresh water storage to last you a few days depending on how much water you use. They also have a storage for waste water. This is essential for freedom camping so that you minimise your impact on the environment. The fresh water available from mains water supplies in New Zealand is usually safe for drinking. However, water supplies in some remote areas may carry waterborne microbes that can cause illness. Before refilling with fresh water, check for signs instructing you to boil drinking water. A hot water heater installed in your campervan makes cooking and showering easy. Hot water is heated by the LPG/ propane or 240V mains power if you’re connected at a campsite. You need to turn the heater on about 40 minutes before hot water is needed. The heater has an electronic ignition, thermostatic control and automatic safety shut down - all the convenience you'd expect at home. 10-15 litres of water is heated at once which is usually enough for a quick shower or washing the dishes. Water from your motorhome sink and shower is collected in a waste (grey) water tank. The tank has an outlet on the outside of your campervan to which you will connect a hose to dispose of the waste water. You can empty your grey water tank and refill with fresh water at any approved dump station. There are hundreds of dump stations all over New Zealand so you won’t have any trouble finding a place to responsibly empty the waste water. Your Wilderness motorhome comes with a detailed touring atlas that includes a dump station map or you can use the Campable app to help you find a dump station nearby your location. Since the grey water tank is about the same size as the fresh water tank you will need to empty it when you refill with fresh water. Our team will show you how to do this when you pick up your vehicle. 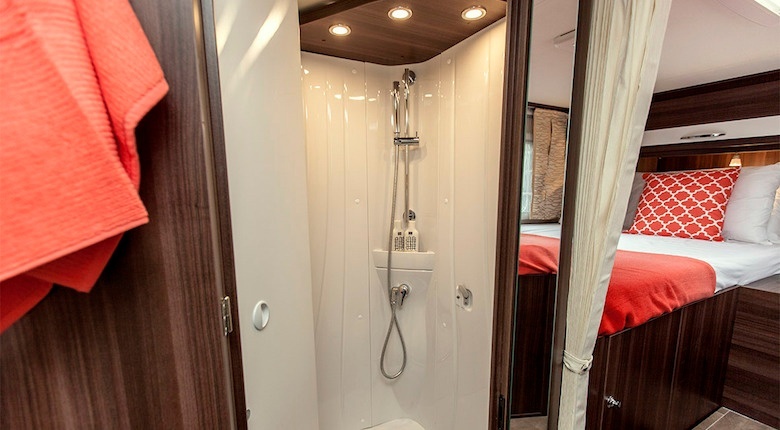 All Wilderness motorhomes come with a built in shower which has sufficient fresh water storage for a minimum of 2 showers per person before needing to be refilled and all come with a hot water heater. Watch the following video on how the water system in a Wilderness motorhome works. Tip: Make sure the rental motorhome you choose has sufficient fresh water storage. Even if you plan to stay at a holiday park every night, you’ll enjoy the convenience of your own toilet and shower on board. You won’t need to look for a public toilet if you need to ‘go’ and if you decide to freedom camp you can also take a shower. Most built-in toilets in New Zealand rental campervans are the cassette type. The contents of the toilet are emptied into a storage container each time you flush. This container can be disconnected from the toilet and carried to a proper disposal station for emptying. Our team will brief you on this when you collect your motorhome. We believe that rental companies should supply a toilet and shower in all their campervans and motorhomes. It’s the responsible thing to do. 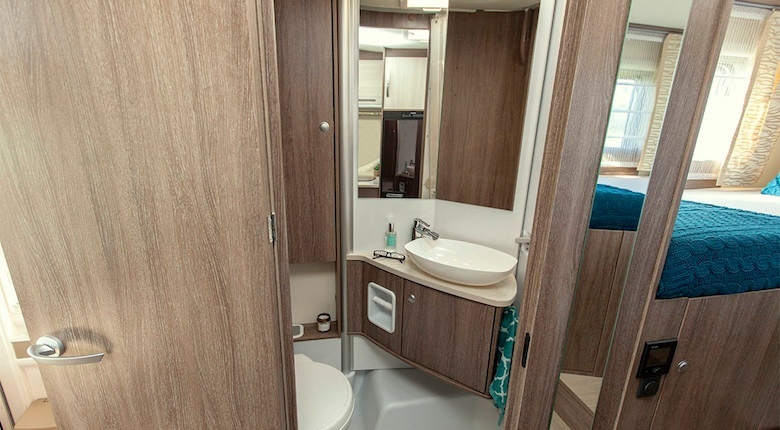 All Wilderness motorhomes come with a built-in toilet and shower. Tip: A motorhome with a built in shower and hot water heater and a toilet is the most convenient especially if you plan to do some freedom camping. You can expect to find at least a fridge and a cooker in your rental campervan. Some models also have a grill and some a microwave oven. Microwave ovens require you to be plugged in to 240V mains power at a campsite to work, so our vehicles that are designed for freedom camping don't have these. The fridge runs off the house battery or 240V mains power if you are plugged in at a campsite and the cooker off bottled gas (LPG/Propane). Fridge size varies widely so be sure to check that it is big enough to store your cold food and drink. If you plan to eat out often you won’t need a big fridge but if you’re going to do the cooking yourself, you will appreciate more cold storage. Some fridges have a small freezer compartment that’s useful if you can’t get to a supermarket every couple of days. Watch the following video on how the refrigeration system in a Wilderness motorhome works. Energy for the cooker is usually supplied by a gas (LPG/Propane) bottle stored in a separate compartment that is accessible from the outside of the campervan only (this is a safety requirement). Gas cookers are easy to operate and are a fast and efficient way to cook while on tour. Two burners are standard but you will find up to four burners helpful if you are cooking for a group. Cookers that also have a griller are useful for freedom camping as the griller can be used for making toast (an electric toaster only works when you’re plugged in to mains power). Watch the following video on how the LPG (propane) system in a Wilderness motorhome works. Ovens are not standard campervan kitchen equipment. 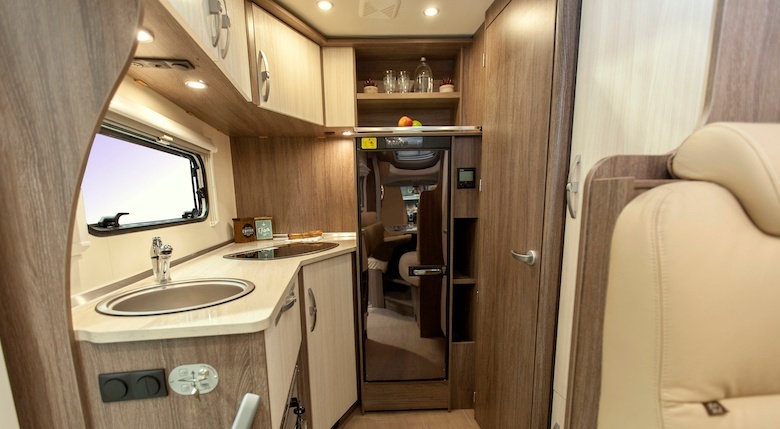 Some bigger campervans and motorhomes may come with a microwave oven. These will only work when you’re plugged in to mains power so won’t be of much use if you plan to freedom camp regularly. Microwave ovens also take up a lot of space in a rental vehicle so you will often find more storage in vehicles that don’t have one. 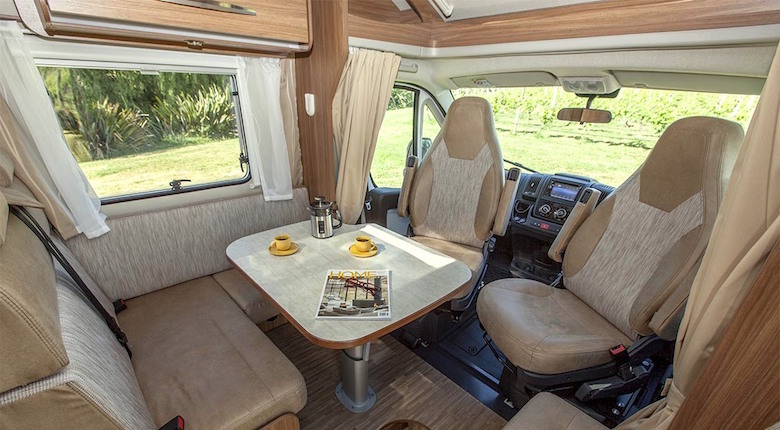 Many companies that build campervans and motorhomes for the New Zealand rental market supply the same vehicles for rental in Australia. Since an air conditioning unit is a necessity in Australia, the vehicles supplied to the New Zealand market usually have one as well. However, New Zealand does not experience the same extreme temperatures as Australia so the air conditioning unit is unnecessary for conditions here. Tip: Think about which appliances you really do need on your vacation and which you can do without. Fewer appliances mean more storage space and less power required. All Wilderness campervans and motorhomes are heated via a thermostatically controlled gas heater. A gas heater is essential if you're planning on freedom camping even in the summer. The heater has a 240V setting which works only when you’re plugged in to mains power at a campsite. The gas heater is fuelled by the same gas/propane bottle that operates the cooker. The heater has an external flue which protects you from fumes. The heater’s fan blows the warm air heating the motorhome quickly. The thermostatic control is very efficient as it only comes on once the air temperature inside the campervan goes below the pre-selected temperature. It’s important to ensure that even on the coldest nights you leave a vent open to allow fresh air flow while the gas heater is on. 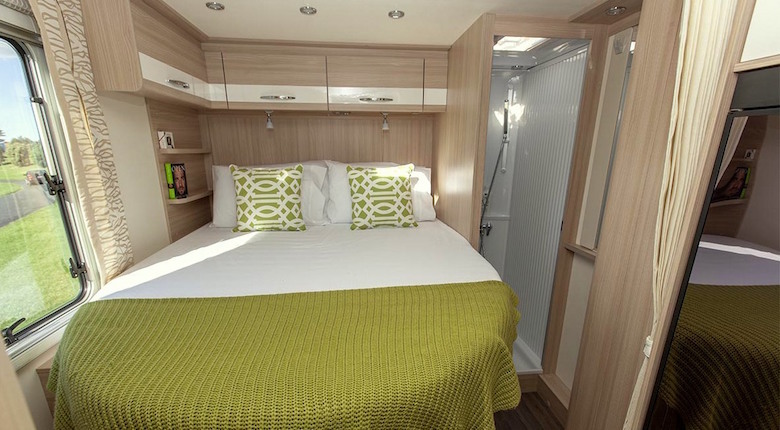 Several of our motorhomes have a unique drying room feature that is a major bonus for drying towels, clothes, and other wet gear. A booster off the central heater is routed to the bathroom to allow it to be heated separate from the rest of the camper. Watch the following video on how the heating system in a Wilderness motorhome works. Tip: We recommend selecting a campervan with a gas heater and good insulation if you’re travelling in the winter. A drying room is big plus in summer and winter if you appreciate a dry towel when you take a shower. Unless you’re an avid crossword fan, you’ll appreciate a built in entertainment system in your motorhome both for listening to music and watching movies on your road trip. While a CD player is standard in rental campervans these days, some companies still only offer a radio cassette player in the driver’s cab. So if you don’t own any cassettes any more, you’ll be stuck with listening to the radio (which tends to drop out in rural areas). Many campervans now have an entertainment system in the living compartment that can not only play DVDs but can also take multiple formats including MP3 or even MP4. You can connect your MP3 player via bluetooth or an auxiliary cable. Be aware that using the DVD player consumes considerable power so if you are not plugged in to 240V mains power and have a movie omnibus evening you need to keep an eye on the house battery level. All Wilderness motorhomes come with a CD and DVD player with at least a 15" LCD screen and a USB input for an external hard drive. Tip: We recommend you bring a few of your favourite movies saved on an external hard drive or hire a few DVDs from the Wilderness rental base when you pick up your motorhome.